Consumers and businesses are facing hikes in electricity charges at a time when the operators of the network are getting bonuses of up to 15 per cent. The two companies responsible for the country’s electricity network are in line for spending increases of €1.8 billion over the next five years, bringing their total budgets to €5.2 billion. This will increase the average electricity bill for a family by at least 5 per cent over the next five years. Businesses can expect similar increases in their electricity costs. A significant proportion of the increases in network charges will go to fund new power lines being planned by the state-owned grid operator Eirgrid. Some €500 million, meanwhile, will be used to fund the rollout of smart electricity meters to two million households by ESB Networks, which maintains the network. However, a report prepared for the Commission for Energy Regulation by consultants has criticised the bonus payments made to staff at Eirgrid. The consultants, Jacobs, found that Eirgrid had consistently paid bonuses of up to 15 per cent to its staff during the economic recession over the past five years. The report said that it would have expected the payments to vary with “some achieving their targets and others failing”. But Eirgrid did not give any precise details of what the staff had done to earn this “performance-related pay”, and the report found that only 14 per cent of the biggest electricity projects were delivered on time over the past five years. The Jacobs report states that between €6 million and €7 million of the money Eirgrid has paid out in bonuses was “inefficient”, and that their cost should not be passed on to electricity customers. It showed that the highest individual bonus payments were to Eirgrid managers, who got 15.4 per cent in 2012. These managers are getting slightly lower performance-related payments of 14.1 per cent this year. There are also performance related payments for Eirgrid professionals (13.2 per cent), directors (10.2 per cent), and those in graduate or support grades(12.6 per cent). The average bonus payment this year is 13.1 per cent. Eirgrid has applied to the regulator to continue paying bonus payments of up to 15 per cent to staff for the next five years. It said it did not make the payments to all staff, and that it was keeping all aspects of its business under review, including staff wages, “to ensure they are competitive and in line with market rates”. The energy regulator is proposing annual increases in the two main electricity charges which fund Eirgrid and ESB Networks. Electricity distribution charges are paid to ESB Networks and account for 25 per cent of customers’ bills. The proposed rises of 1.9 per cent per year up to 2020 are on top of inflation. Economist Stephen Kinsella has calculated that this equates to an 18 per cent increase in distribution charges over the next five years. He said this alone will increase the average electricity bill by almost 5 per cent over the period. “Oil prices are collapsing and commodity prices are in the toilet. But the operators are hoovering up a bigger increase in the recovery for themselves,” he said. The Commission for Energy Regulation has also proposed that the electricity transmission charges, which are paid to Eirgrid, will rise by 2.5 per cent per year up to 2020. These charges have a smaller impact on households because they only account for 5 per cent of customers bills. The regulator has not released any figures on what the overall rise in electricity charges would cost consumers over the next five years. A spokesman said the proposed impact this year would be a 1 per cent rise in electricity bills – which would add around €10 to an annual household bill. “The actual outcome for customer prices depends, among other factors, on international fuel and related generation costs, which are currently circa 50 per cent of the overall cost of electricity to customers,” he said. Eirgrid’s staffing costs went €16 million over budget over the past five years, with its 278 staff now paid an average salary of €97,000 each. It argued that it was using a “holistic approach” by increasing staff numbers and reducing the hiring of outside contractors. It has to work with ESB Networks, which has 3,145 staff, to maintain the electricity network. They get an average salary of €80,000 and bonuses of up to 8 per cent. But the Jacobs report said there were signs that targets were “sufficiently robust”. ESB Networks failed to deliver €10 million of efficiency savings that it had promised and is consistently missing its targets for maintaining the electricity network. The consultants said this consistent underperformance may lead to “an ongoing degradation of the health of the assets”. ESB Networks said it was inappropriate to comment because the public consultation on the electricity charges was still ongoing. “We will participate in that consultation and look forward to conclusion of the process,” a spokesman said. 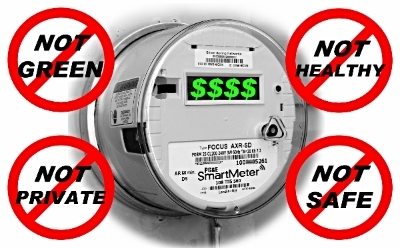 Smart Meters What Are They And Why We Should Be Worried About Them! Read all about 'Smart Meters' at www.fliuch.org/smart-meters.